Material balances are important first step when designing a new process or analysing an existing one. They are almost always prerequisite to all other calculations in the solution of process engineering problems. Stoichiometric or Theoretical Combustion is the ideal combustion process where fuel is burned completely. With unburned components in the exhaust gas, such as C, H2, CO, the combustion process is uncompleted and not stoichiometric. 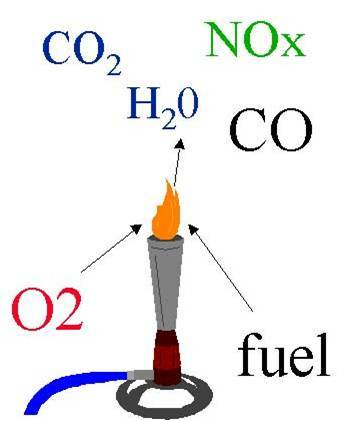 To determine the excess air or excess fuel for a combustion system we starts with the stoichiometric air-fuel ratio. The stoichiometric ratio is the perfect ideal fuel ratio where the chemical mixing proportion is correct. When burned all fuel and air is consumed without any excess left over. Process heating equipment are rarely run that way. “On-ratio” combustion used in boilers and high temperature process furnaces usually incorporates a modest amount of excess air – about 10 to 20% more than what is needed to burn the fuel completely. If an insufficient amount of air is supplied to the burner, unburned fuel, soot, smoke, and carbon monoxide exhausts from the boiler – resulting in heat transfer surface fouling, pollution, lower combustion efficiency, flame instability and a potential for explosion. To avoid inefficient and unsafe conditions boilers normally operate at an excess air level. This excess air level also provides protection from insufficient oxygen conditions caused by variations in fuel composition and “operating slops” in the fuel-air control system. Typical values of excess air are indicated for various fuels in the table below. A combustion reaction is a type of chemical reactions where a compound and an oxidant is reacted to produce heat and a new product.